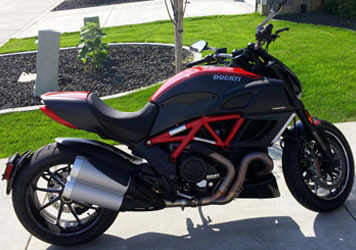 Project Diavel is an enthusiast web site that documents the selection, evaluation, installation, and use of products for a guy who bought a Ducati Diavel. Find interesting information, view photos, and watch videos. This web site will continue to be updated as new products are reviewed regularly. Please check back often to see the latest results. 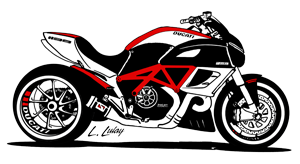 Disclaimer: I am in no way affiliated with the Ducati brand and they have full licensing and Copyright of the bike and Ducati brand products. The Project Diavel bike will be at the Salem Roadster Show and the Portland Roadster Show (see details at Rides Done Right. 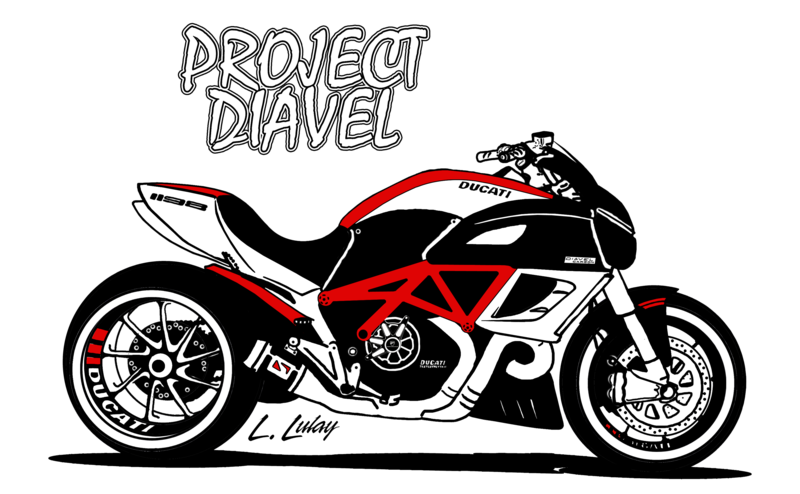 A t-shirt company has offered to make shirts that have my Project Diavel artwork on the back, and you can view several of their options on the RDR shirts page and there are links to contact the vendor directly to order. Since I am starting a new website and YouTube channel for Rides Done Right, I will be posting all of my new videos on that channel instead. The new site will include a regular live podcast where I discuss various motorized topics with guests. Please subscribe and get involved with your posts - I want your feedback to help determine topics and more. I picked up the hugger and case plates this week. I whipped up a quick two minute video to show the sweet custom look of Ducati red racing stripes on a DP carbon hugger. The SHAD hardbags and backrest have arrived and the reviews and videos are done. I am still waiting on some painted parts, but there are plenty of photos to see while waiting. For details, please see the SHAD page for the review details, the SHAD products area for prices, and the SHAD videos on the videos page. Who am I? What is this about? 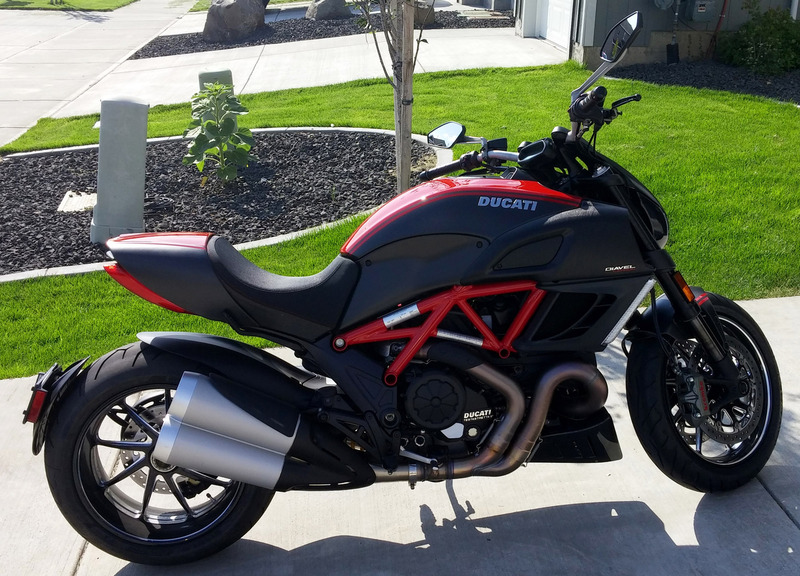 How did I find out about the Diavel and what lead up to the purchase? What are the specifications and accessories on the bike at the start of this project? 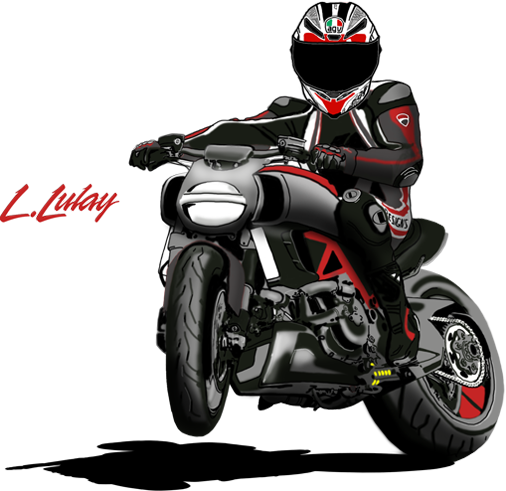 See the products I picked specifically for Project Diavel - and get details, links, prices for each product, and Project Diavel brands - with links to their websites and more info. Read about my experience with each item I chose for this project which includes: first impression, overview of installation, photos, links to my videos, links to related details on the Product Details page, and more. 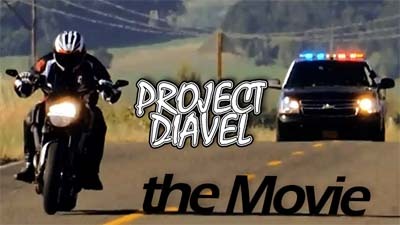 This is the complete listing of videos for Project Diavel - with description, video length and reference photo. I am a graphic artist and web designer with a passion for motorcycles. This website has given me an opportunity to work on my skills in an area that I have great interest. It's not very often in life we can combine what we do for a living with things we like (business web sites are generally boring and don't offer me artistic freedom - I do what a customer wants, not particularly what I want). In addition, this site provides visitors with details on modifications and accessories I've done to my bike - which may spawn ideas for their projects. Watch close for links to great resources, and click photos for high resolution. I've been riding and tweaking street bikes since 1982 (and atv's long before that). Consequently I didn't just get off the turnip truck, and I have a fair amount of general knowledge regarding street bikes. Brands I've owned: Honda, Yamaha, Kawasaki, Suzuki, Triumph, Harley, and Ducati (way too many to count over the years). My mechanical prowess is based on my limited abilities, knowledge, and tools. I am not a mechanic, I am a web developer and graphic artist... so keep that in mind when watching my installation videos. There are certainly alternative ways of doing things, and I will be demonstrating my experiences based on "how it went for me". What is in it for me? It has been a challenging project to attempt to make a website that displayed as good on a smart phone as it does on a desktop. I haven't put this kind of compatibility effort into any of my personal projects. I am not making an income off of this, but at some point someone may want to have me build them a web site or create artwork for them... if that someone is you, email me at laz@lulays.com. I�ve always thought Ducati�s looked great, but knew that they were expensive... so I chose to admire and not get close enough to "get bit". Over the last couple of years I took a few test rides (a 998 and 1098) but to my surprise, those bikes didn't really do it for me (I liked my R1 better)... then came the summer of 2014. A friend from work (Gene) started to ride with our group, and he showed up on a Ducati. I thought, that looks pretty sweet. Then the next ride he shows up on a different Ducati... and I knew he was going to fit nicely with our little group. We started riding every weekend until winter came. On one of those rides he talked me into stopping by the Ducati dealer... and I thought, that should be no problem - I had not seen or rode one that was going to change my life and make me feel the need to sell stuff and go spend some more money. I saw my first Diavel parked outside the dealer and spent a lot of time out there before I ever went in. Then when I got in I saw one and sat on it... I was not expecting that - the most comfortable bike with a sporty edge that I had ever sat on. A better riding position than even my FZ1. I couldn't get out of there without going on a test ride. Jason at the dealership was great and let Gene take Koggs and I out for a demo ride. One ride and I knew that the next bike I bought would be a Diavel. Fast forward to New Years Eve of 2014 and at 10:30PM it arrived in front of my house. I was blessed to start out 2015 the right way... with a sweet new bike. With 162HP from the factory, a huge 240 rear tire stock, and the upgraded Carbon Edition... I thought, this will be different... I probably won't do much if anything to this bike - it looks and performs great. If you've seen my other bike sites or know me, you will know I'm not real good at leaving stuff alone. So I started making my shopping list and then attempted to prioritize it. I do custom artwork, so contact me if you have a project. The Diavel to the right (and of course the one at the top of this page) is an example (click one to the right to see full size). 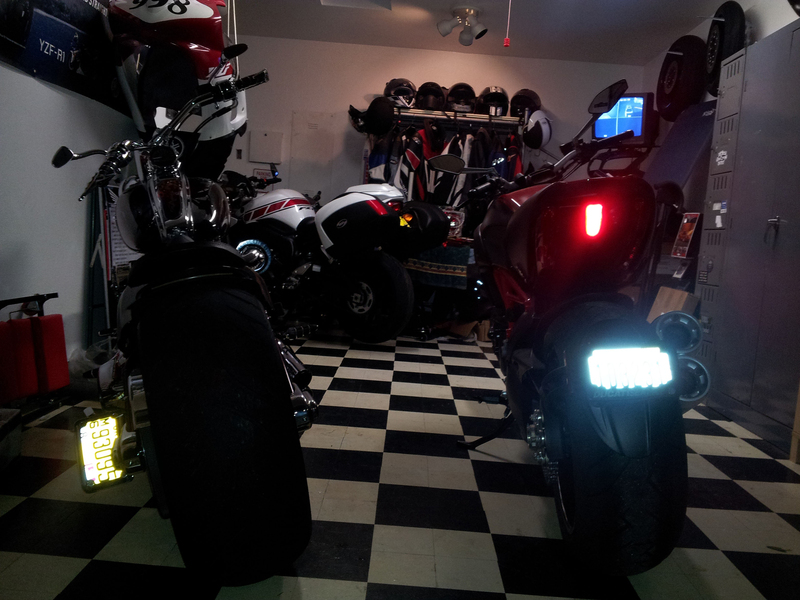 Special thanks to all the folks that have helped with great advice and opinions on the Diavel-Forum. If you like these sites, also checkout the site I did for my brother's Willys.